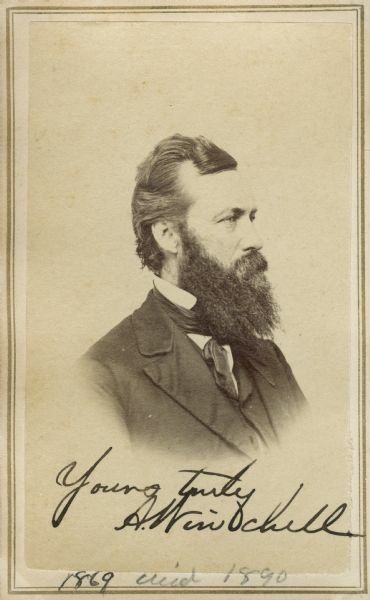 Carte-de-visite portrait photograph of Alexander Winchell (1824-1891), former state geologist of Michigan and professor of Geology and Paleontology at the University of Michigan. Winchell made efforts to reconcile the conflict between evolution and religion in his writing and oratory. Shown here sitting in three-quarter profile. "1869, died 1890," has been handwritten at the bottom. Winchell has signed this card, "Yours truly, A. Winchell." Photography studio credit on the back reads, "Revenaugh & Co., (Successor to Geo. C. Gillett,). Photographie and Art Studio, Kelley's Block, East Huron St., Ann Arbor, Mich." From album of portrait photographs collected by Lapham depicting scientists and artists, ca. 1860-ca. 1875. Images include portraits of geologists, botanists, sculptors, and authors. First of two portraits depicting Winchell in Lapham's ablum. Refer to WHI Image ID 47834 for the other.